We've been stuck in a food rut lately, preferring familiar tastes and convenience over venturing into uncharted territory. I know, we sound frightfully middle aged :(We decided to snap out of it and try somewhere new. Chow Thye Road, filled with rows of bustling eateries, is a somewhat love-hate for me, you're guaranteed to find something yummy there to eat but parking is near impossible. 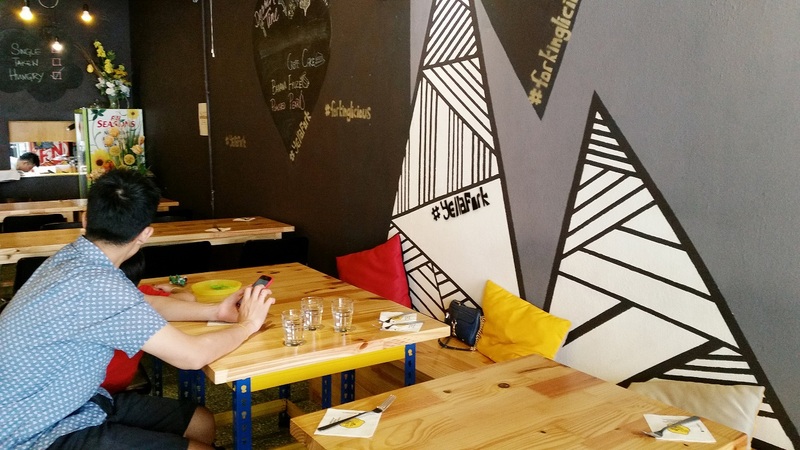 We chanced upon Yella Fork, an Australian inspired cafe, that offers *thank goodness* free parking inside. 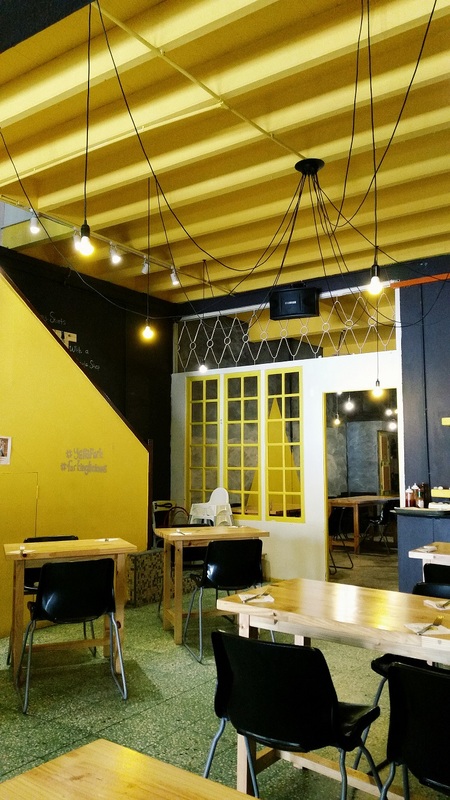 The interior is modern with hues of grays and blacks livened up by pops of cheery yellows. I was glad to see the familiar green speckled marble flooring from the 70s untouched. The layout is spacious with utilitarian wooden tables that reminded me of Ikea for some reason and beautiful wooden bench seats that had colourful, soft cushions. Service was prompt and very friendly with the waitress taking pains to explain each dish and recommendations for us.We found the dishes on the menu to be decently priced and had a touch of Asian fusion to most of them. The portions are just right though if you're a big eater (*ahem Hubs*) you might want to top up with appetizers or another dish to share. 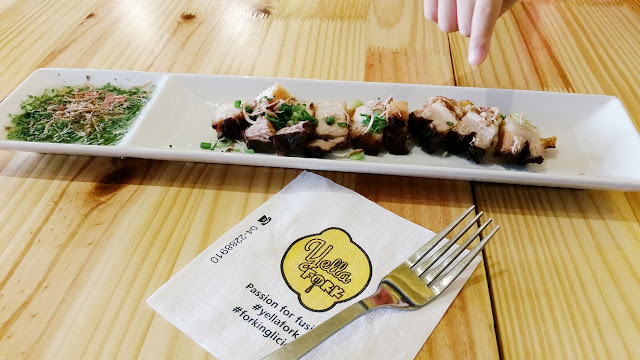 We were highly recommended Pork You (RM10), an appetizer of slow roasted pork belly served with the chef's home made sauce. "Siew bak!" Bubs exclaimed happily the moment he saw his favourite-st food in the world placed in front of him. And yes, that's his finger pointing at the piece he wants. This dish was a winner with us, the pieces of pork belly were juicy and the crackling went perfectly with the tangy dipping sauce that had finely sliced bunga kantan (torch lily) sprinkled. I could happily eat this for the rest of my life! 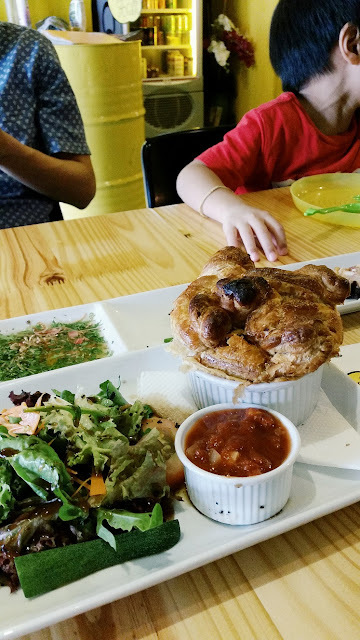 Bubs and I love our carbs so can I say it was the assurance of home made pastry that drew us to the Pie in the Sky (RM20), a creamy chicken filling topped with the most gorgeous twists of fragrant pie crust. It has been years since I last tasted pie crust this amazing and I'd happily pay for extra slices of this. A dash of the tomato chutney (homemade, what else!) added some zing to the soft chicken pieces. It comes with a generous serving of side salad drenched in a yummy balsamic vinegar dressing. 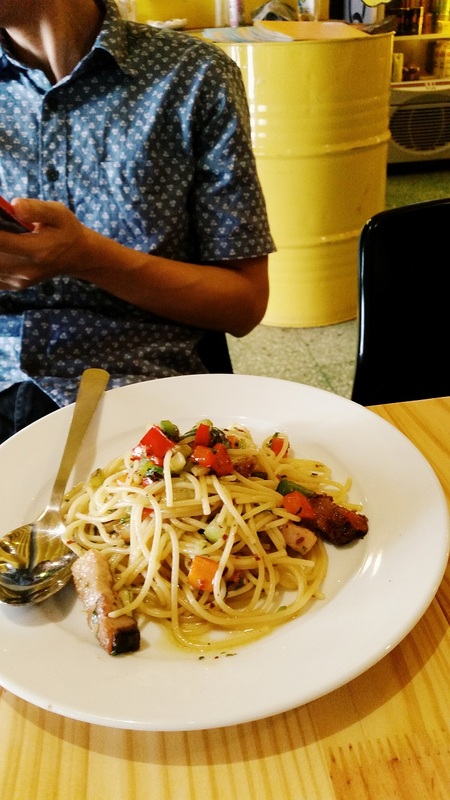 I thought the Redny's Sensation (RM15.50) was a very well balanced dishes. The chilli flake flecked honey-sweet sauce, veggie pieces and generous pork belly chunks complemented the pasta.